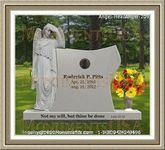 We carry every possible type of Headstone and Monument with a large range of products and price ranges. Whether you need a traditional headstone or something unique and extravagant - we offer it and specialize in everything. 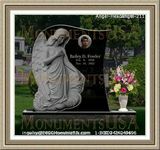 At 1800Monuments we design and make all kinds of customized sculptured headstones according to your very personal needs, for your beloved ones. We don't limit ourselves to geography. Many Monument Dealers and Funeral Homes, even other Internet based Monument Companies limit themselves and most importantly...limit their customers to manufacturers closest to their physical location. As in all industries, certain manufacturers have their specialties. So why not go to the best possible artisans for each individual memorial? Our customers deserve the best and that's what we give them. Please feel free to browse through our website and see our beautiful and diverse collection of memorials.